The O2Wind is the reliable, long range wifi workhorse of the RadioLabs product line.. At 1 Watt (1000 milliwatts!) this unit is the highest output router legally available. Used by NASA, in a high reliability, zero failure option application, the o2Wind performs both with speed, reliability and long range performance. If you need a high power router for lots of coverage, this is the unit for you. w/ NEW POE OUTPUT Capability!! 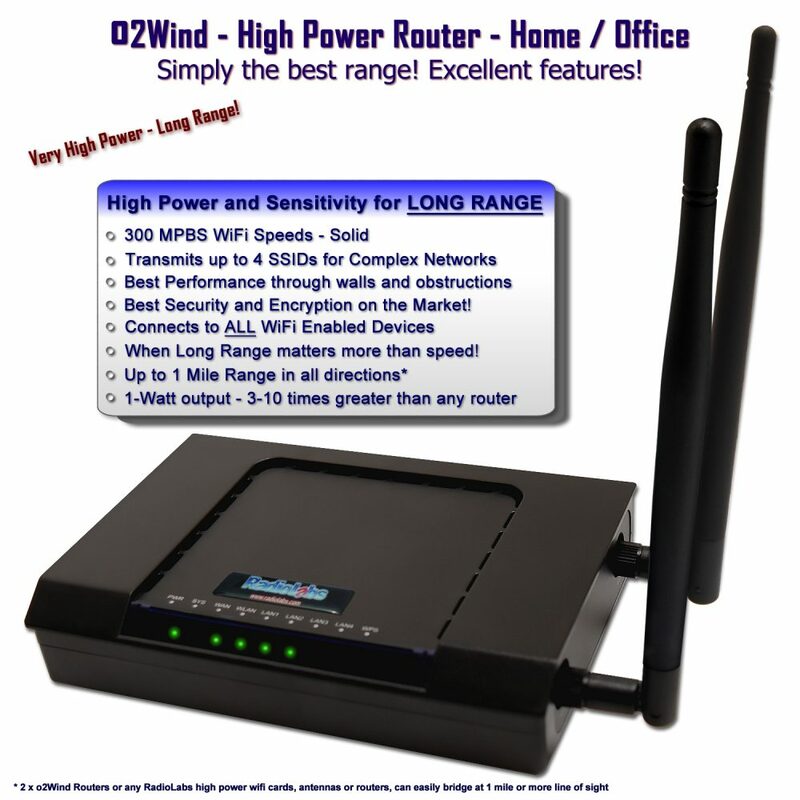 Simply put, the o2Wind WiFi Router, is the longest Range, most reliable router you will ever buy. In a confusing world of routers, this IS the router you want for everyday home and internet use. For 99% of all home or office WiFi use, RadioLabs amazingly powerful, yet inexpensive o2Wind router packs huge features and amazing range into one small, amazingly versatile router. Let’s face it, in today’s world of blazing fast speeds, most people are doing nothing but surfing the web. Most of the speeds achieved and advertised, are very low range, work on multiple bands only, work with only 1 type of card, and are weak at best. RadioLabs has changed that, with the invention of the long range wifi router, the o2Wind, high power wifi / wireless network router. RadioLabs now has a full 1 Watt (1000mW) 802.11 N speed router. With the multiple ESSID capability and QoS enhancement, our customers have asked for it and RadioLabs is glad to rise to the occasion and answer the call. The O2Wind is a great addition to any industrial, commercial or residential setting. With a high-speed data-rate of up to 300Mbps, this is the best networking router on the market. How fast of a router do I need? The world of networking and the WiFi market itself is flooded with grossly over-rated speeds, which we call “Marketing Bits”, where the speeds increase to a point, where no computer on the market can handle this much data, and there’s literally no need for the fastest router. What our customers need, is range. Most incoming broadband is in the 50-100 MBPS speed, and the newest blazing fast routers on the market are much faster than what the broadband can even handle. Why supply a 5 foot diameter pipe, to a standard hose bib ? Also, these ultra fast speeds, require special wifi cards to handle the dual, or tri-band output. What keeps you online and your data moving fast, is power and sensitivity, the key factors in today’s broadband world. The lower the signal strength, the slower the speeds, the less sensitivity, the harder it is for your weaker wifi enabled products to talk back to the router. The single most important factor to long range wifi connectivity is an excellent chipset, the correct frequency to penetrate through walls and obstructions, and a good reliable data path which doesn’t require fancy cards, clear line of sight, or proprietary hardware to give you the advertised speeds. The o2Wind, handles this, with an ultra-sensitive chipset, a high power amplifier and a robust set of tools allowing for the best power and long range wifi your home or office application requires. For those of you looking for both high power, plus a fast networking router, the RadioLabs o2Air-AC, is a blazing fast, dual band network router, which offers all the high power, long range features of the o2Wind, plus, a FAST 5.8 GHz dual band side, for range, reliability and can boost range on single band, the same as the o2Wind. POE Output Ethernet to power bridges and access points! IMPORTANT Update: NEW 24 Volt Standard POE output! Not just POE Input, yes, Output! The O2Wind is one of the only High Power, 1-Watt routers on the market, with Standard 24v POE Output built in. Yes, you can power the router via 12v, and run an external radio off of the POE port up to 330 Feet away via CAT-5. This is an important new feature. The O2Wind, allows POE input as well, so you can run this mobile off of traditional 12volts into the DC input port, then, run an O2Surf, or Bullet off of the built-in POE port. This is a HUGE move on our part to allow you to either capture a signal from a distant location and repeat it right there in your home, RV or anywhere you have voltage, and then control our O2Surf remote, as either an Access Point, or in Client Bridge mode. With up to 3-10 times the output power of a standard off-the-shelf WiFi router, the O2Wind provides a massive gain in range and signal stability over the competition. The O2Wind 1 Watt Wireless Router is the most powerful stand-alone wireless router on the market. You cannot get a more powerful wireless device without an FCC license. Added functionality allows the O2Wind to act as a Wireless Access Point, WDS Bridge Unit*, Gateway, Ethernet Client and a Universal Repeater. Featuring the latest in security protocol, the O2Wind supports WEP, WPA, WPA(PSK) and WPA2/WPA2 Mixed with TKIP and AES encryption to keep your wireless network safe and secure. 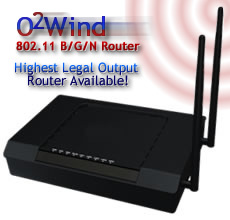 The O2Wind comes with 2 external antennas (RP-SMA type connectors) complying with 2.4GHz IEEE 802.11N 2×2 MIMO. This device is an excellent choice for those who need maximum coverage and performance out of their 802.11N wireless equipment. With 1000 milliwatts (1 Watt) of WiFi transmit power, 5dB transmit antennas included, 2 RP-SMA antenna ports, an ultra-sensitive wifi receiver chipset and line of sight, the O2Wind High Power WiFi Router can cover up to a mile radius or more, depending on wifi card, external wifi bridge or wireless enabled device’s specifications. (see features tab for more information). The O2Wind has a extremely high power output. Under no circumstances should any signal amplifier be used to augment the power output of the O2Wind. RP-SMA Connectors for quick external antenna installation! The O2Wind supports RadioLabs WDS, also known as Wireless Distribution System or the Bridge/Repeater Mode, for point-to-point or point-to-multipoint communication and covers dead spots in Wireless LAN’s. WDS allows the O2Wind to wirelessly communicate with other RadioLabs O2Wind Access Points and Routers with WDS protocol. For more information on this unique feature, please read the Advanced User manual.